Cornish game hens are a broiler chicken that is mostly comprised of white meat only. 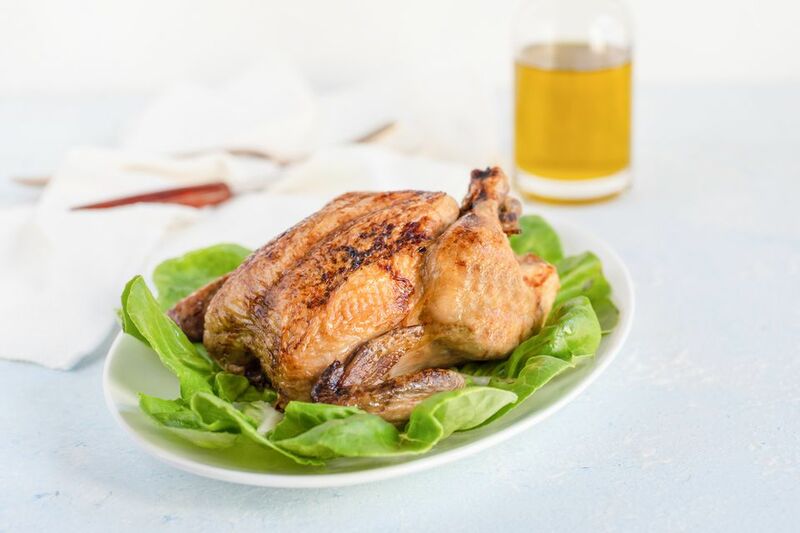 Also known as poussin, the Cornish hen has a delicate flavor and is often roasted whole or barbecued. There are many ways to season and prepare Cornish hens, like with orange marmalade or spice. This glazed Cornish hens recipe is great for single servings or entrees for dinner parties or holiday meals. You can serve the hens straight out of the oven, as you would a roasted chicken, with crispy browned skin and moist, tender meat. Sides that go great with the hen include roasted or steamed vegetables, baked or mashed potatoes, or a simple salad. Derived from The Woman's Day Cookbook by Kathy Farrell-Kingsley, the following recipes highlight seven different delicious sauces that take less than 10 minutes to make and give some pizzazz to Cornish hens. You can also use these ideas for roast chicken by increasing the cooking time accordingly. If you want to dress up your Cornish game hens, prepare the hens before roasting with one of the rubs detailed below. Add the glazes in the last 15 or 20 minutes of roasting, as noted. Roast the hens at 375 F for about 1 hour, regardless of the glaze or rub you choose (or if you choose not to add one at all). When the juices run clear (when a thigh is pierced with a knife) and a meat thermometer registers 170 F, the hens are done. Serve Cornish game hens simply roasted out of the oven or with one of the variations detailed below. Apricot Glaze: Mix 1/2 cup apricot jam, 2 tablespoons of soy sauce, 2 tablespoons of Dijon mustard, and 2 tablespoons honey. Brush the apricot glaze over the hens during the last 15 to 20 minutes of roasting. Asian Accent: Mix 2 tablespoons of soy sauce, 2 tablespoons of chicken broth, and 1 teaspoon of sesame oil. Brush the mixture over the hens and pour a little into the cavities before roasting. Citrus Glaze: Mix 1/4 cup of thawed, frozen orange juice concentrate, 2 tablespoons of Dijon mustard, and 2 tablespoons of honey until well-blended. Brush the glaze over the hens during the last 15 to 20 minutes of roasting. Garlic-Herb: Mix 2 tablespoons of minced fresh garlic, 2 teaspoons of finely chopped fresh thyme, 2 teaspoons of finely chopped fresh rosemary, and 2 teaspoons of finely chopped sage. Loosen the breast skin of each hen and rub one-quarter of the mixture under the skin of each bird. Lemon-Basil: Rub the outside of the hens with a cut lemon and brush with melted butter. Place one lemon half and a sprig of fresh basil into each cavity. Mexican Spiced: Rub the outside of the hens with packaged taco seasoning and lightly coat with cooking spray. Mustard-Herb: Coat the outside of each hen with about 1 tablespoon of Dijon mustard. Sprinkle with a mixture of dried tarragon, basil, and thyme. Deglaze the pan after roasting with 3/4 cup of white wine and serve with the pan juices.